One kitchen remodeling design trend that’s really popular right now is to allow natural light in through installing new windows or skylights. With wide open kitchens being designed for new homes today, people are enjoying more spacious and brighter kitchens. Most old kitchens can be redesigned to allow more natural light in. Allowing natural light to enter any room will make it lighter and brighter. It will also make the room look and feel more spacious. Bringing natural light into a kitchen can be challenging, however. The placement and shape of many kitchens limit the number and size of windows which can be installed. But there are other options which can be incorporated into the new kitchen remodeling design. Do you have a dark kitchen right now? 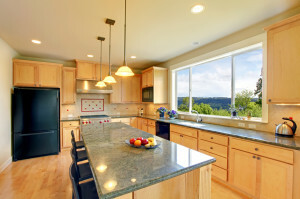 Here are some ideas which you may want for your kitchen remodeling project. 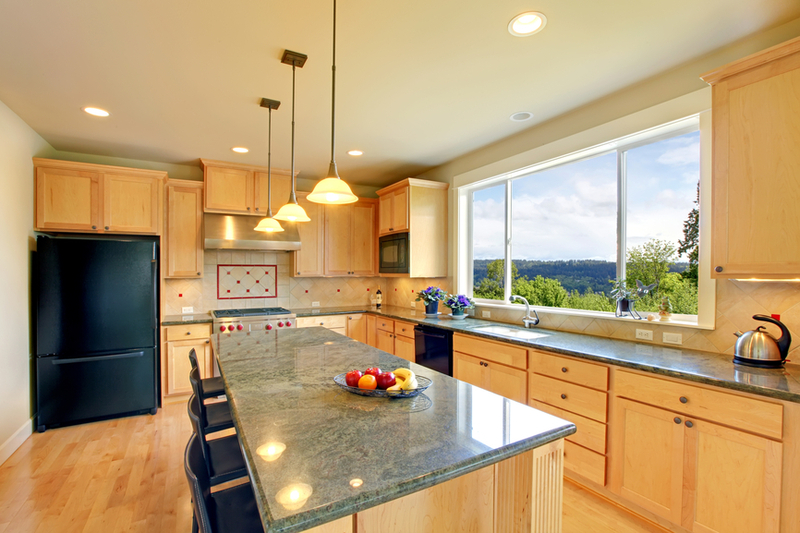 Of course, the most common way to bring natural light into a kitchen is by installing more windows or replacing smaller windows with larger ones. If you have a long kitchen with an area for a breakfast table, you might be able to place tall windows on either side of a french door. Bay or bow windows are also another way to allow more light in. You might choose clear fixed glass and place a blind or shade over the opening so you can block light or add privacy. Or, you could choose to install a frosted glass or something translucent. The light entering the room will make the room more welcoming and spacious. Another way to introduce more light into your kitchen is to look to the ceiling for opportunities. Skylights and roof windows will bring in large amounts of natural light. In fact, some lighting experts say that skylights can provide as much as 30% more natural light than vertical windows. Skylights and roof windows can be installed on a sloping roof or on a flat roof. The difference between the two is whether or not the window can be opened. In many cases, roof windows can be operated with a handheld remote for easy opening and closing. Both skylights and roof windows are more insulating and better made today, so there are plenty of great options. If you aren’t able to install a roof window or skylight, you could introduce natural light into the kitchen by installing tube lights. Tube lights run from the roof through the attic and on into the kitchen. They work by reflecting natural light off mirrors which are specifically placed inside the tube to offer the most light. They are available in several sizes. Tube lights can be strategically placed, so be sure your kitchen remodeling design plan incorporates several for maximum effect. Incorporating more natural light into your kitchen remodeling design will certainly brighten the space and make it look and feel larger. Anytime you want to reflect light, you can do so with glass, mirrors, and metal surfaces. Today, these materials are in trend for kitchen remodeling. For instance, glass tiles are installed for backsplashes and many countertop materials will reflect light. Stainless steel, copper, chrome, and other metals are installed as appliances, faucets, light fixtures, countertops, and vent hoods. Cabinetry can be inset with mirrors or glass. All these surfaces will help to reflect light around your new kitchen space. If you are able to install more windows in the kitchen area, place a mirror on the opposite wall. This will reflect the most light in the room as it streams in from the outdoors. Anytime you decide to start a kitchen remodeling project, you’ll be better off with a construction company who will help with the design. Not all remodeling companies have a designer available, so be sure you ask. You’ll also want them to take care of any necessary permitting and inspections. With professional help, your new kitchen will be exactly what you want it to be. If you have questions or are looking for a Denver Kitchen Design expert, then give us a call today at 303-506-1262 or complete our online request form.